Spam is an essential ingredient of Okinawan Goya Chanpuru. Some may wonder why local Okinawans are so fond of canned meat that is more associated with economic hardship back in North America. Personally, before I came to Okinawa I stayed far away from any meat that came from a can, but after a decade in Okinawa eating Goya Chanpuru with SPAM, canned meat seems as normal as any dish. 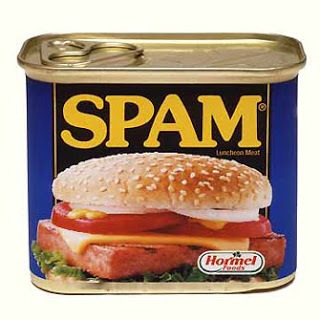 SPAM is a canned precooked meat product which contains chopped up pork shoulder meat, salt, water and modified potato starch. It was a GI’s dream food back in WW II when meat rationing was in effect. Soldiers on the field are quoted as saying “a can of SPAM is like heaven after eating a shoe sole”. The popularity of SPAM continued after the war with soldiers and civilians on Okinawa. Due to meat being a scarce food product, the American GIs would give out free SPAM to families on Okinawa during tough times after the war. They also gave the cans of meat out in a campaign to win local trust. SPAM then became a household name in Okinawa. There is an Okinawa saying that states Okinawan cuisine “starts with pig and ends with pig”. It’s no coincidence that SPAM is full of pork and loved by locals. 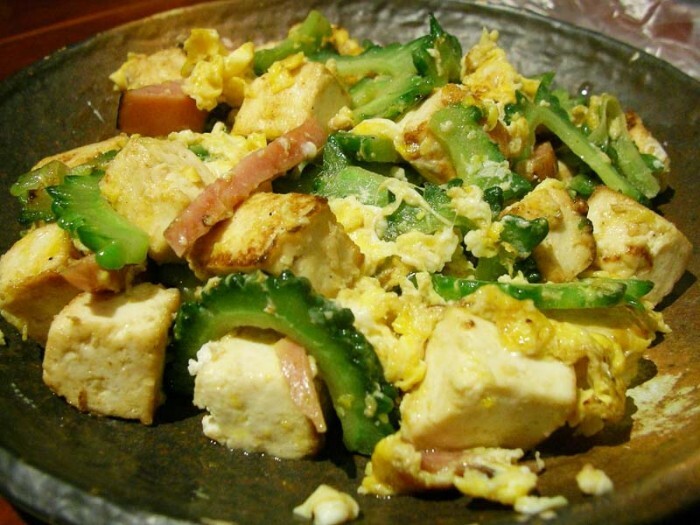 One of the most popular Okinawan dishes containing SPAM is Goya Chanpuru. This dish consists of chopped up Goya (bitter gourd), tofu, egg and, of course, rectangular cubes of the irresistible SPAM. The word “Chanpuru” is derived from the Indonesian word “campur” meaning “mix”. When eating the dish for lunch or dinner you will need something to wash it down. An Orion beer complements the taste of the Goya Chanpuru perfectly. Judging by SPAM’s extensive marketing, they want to be in every household in Okinawa. Although it is just a food product, it is also a part of Okinawan culture just as much as the Okinawa Sanshin (Okinawan Guitar). SPAM is used not only for Goya Chanpuru but is placed in miso soup and even on rice as an Onigiri (rice ball snack). The next time you visit an Okinawan restaurant and would like to taste some original Okinawan cuisine, be sure to start with something like Goya Chanpuru. You will not only be surprised how delicious SPAM can taste, but you will also be indulging in a slice of Okinawan culture. If you were to leave Okinawa and feel nostalgic, you can always pick up a can of SPAM and prepare this dish at home, evoking a pleasant rush of memories of Okinawa.